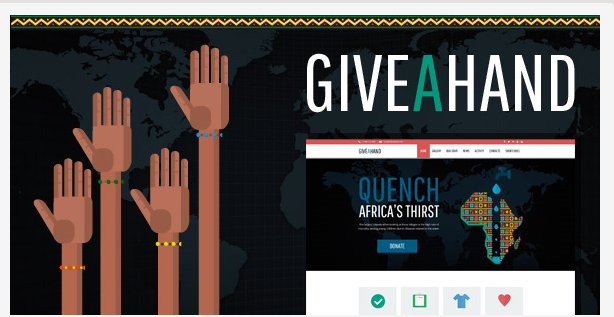 Charities and non-profit organizations have their unique set of requirements when it comes to website development. While some of them want to look exactly similar to the other organizations already prevalent over the internet, there are some charities that want a 100% unique outlook for their organization. WordPress is the CMS(Content Management System) that has enabled the latter type of organizations find their unique niche among the huge crowd of charity and non-profit organizations. Through this post, I’ll give you a rundown on 11 amazing WordPress themes that are specially designed for websites belonging to charity groups and other non-profit organizations. 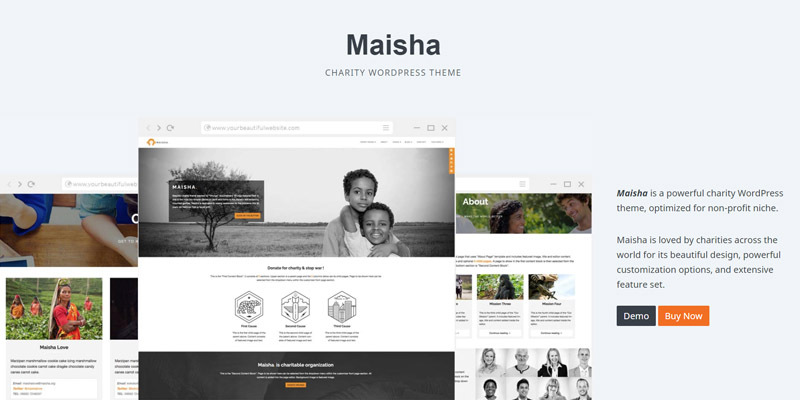 Maisha comes packed with all the features a non-profit or charity website needs. You can take donations through multiple payment providers, set donation goals, and even set up multiple causes and multiple goals. 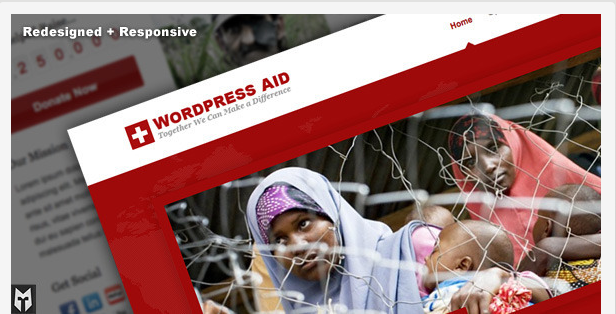 It’s definitely one of the best charity WordPress themes on the market today. 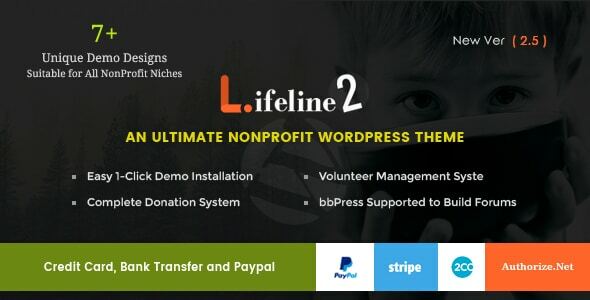 Powerful multipurpose nonprofit WordPress theme, Lifeline 2, is perfectly suited theme for fundraising, environment, charity and one cause niche sites to name a few. A fully responsive theme that is super easy to customize and comes with plenty premium features that you can benefit from. You can even create a complete donation and volunteer management systems that you can add to your amazing website without any coding knowledge. 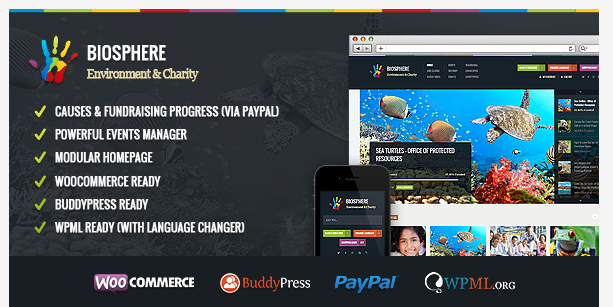 Biosphere is a dual-purpose WordPress theme suitable for websites belonging to charity groups and environmentalists. Some noticeable features of this theme include a powerful Events feature, Dynamic Homepage, Full width slider, BuddyPress Ready, WooCommerce Ready, Translation Ready and many more. 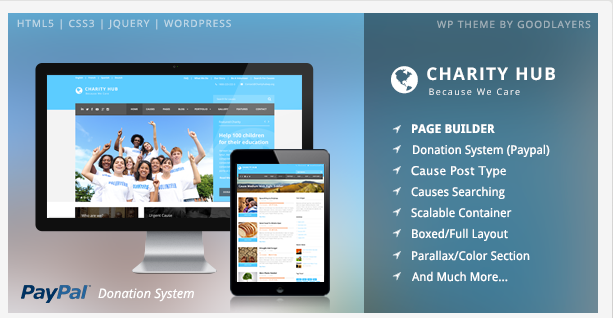 Charitas/Foundation is a simple and clean WordPress theme specially designed for websites belonging to charity groups, NGOs(Non-Government Organizations), foundations, political organizations etc. 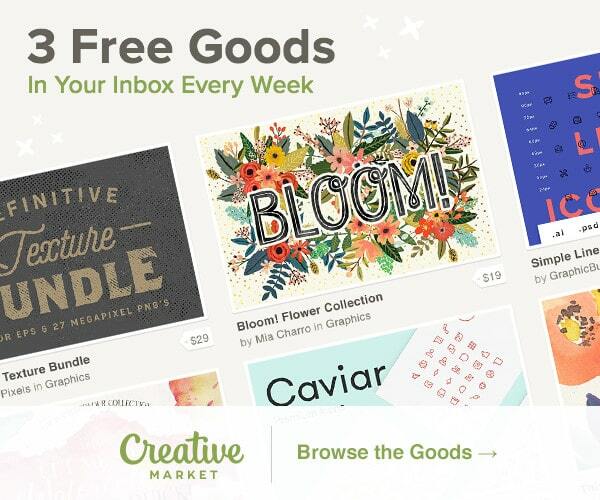 Charitas comes with unlimited color schemes, custom post type, custom share buttons and much more. 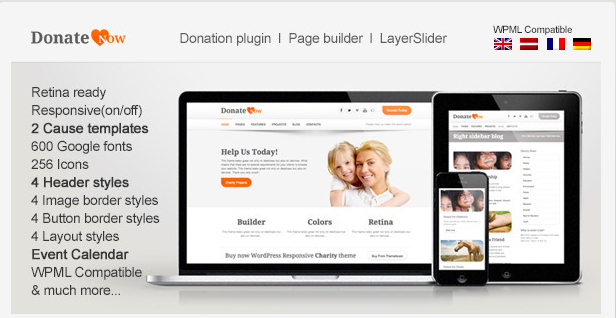 DonateNow is a retina-ready WordPress theme useful for any type of website that is related to charity organization, non-profit organization, portfolios, blogs etc. Fully responsive design of DonateNow makes it a must-have for websites with greater number of visitors pouring in from mobile devices. 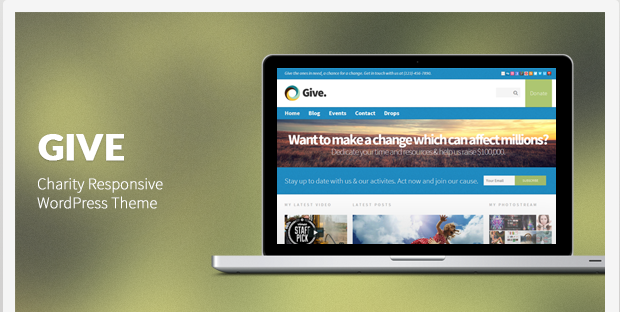 Give is the perfect WordPress theme for rendering a brand new look and feel to your charity or NGO website. Backed with a fully responsive design, this theme is extremely versatile and serves as an excellent means of showcasing the good cause behind the fund raising initiative. Relief is yet another amazing WordPress theme specially designed keeping the requirements of charity groups and non-profit organizations in mind. Best features of this WordPress theme include: 5 stunning color schemes, fully responsive design, extensive options panel, Google fonts, Localization ready and many more. Aid is a WordPress theme that serves as an ideal theme for websites belonging to charity organizations.Impressive features available with this WordPress theme include an updated responsive design, retina support, an awesome icon support, translation ready, valid HTML Markup, Unlimited color options, easy layout controller, customized parallax slider, easy logo customization, WordPress menu support, easy thumbnail images, advanced jQuery animations and effects, full-width page template and many more. 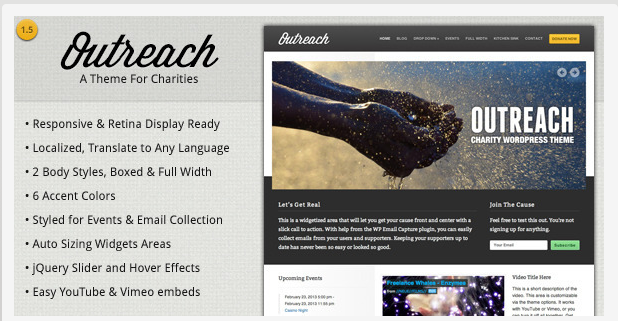 Outreach is a charity WordPress theme built with WP Email Capture plugin for enabling effective collection of names and emails of all supporters. 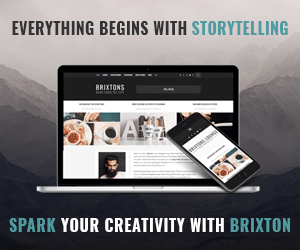 This is a responsive and retina-ready WordPress theme with 2 body styles, 6 background pattern options, 6 accent colors and much more. In addition to this, the 4 custom widgets enable the website administrator to tweak the typography of the theme in a convenient manner. There are other options for embedding Vimeo and YouTube videos on the website’s home page and within the blog posts. 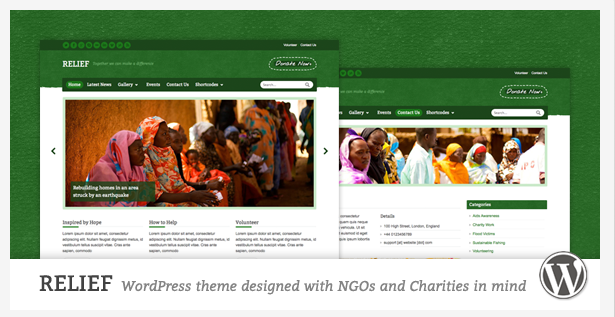 Charity Hub is a fully responsive, clean WordPress theme especially designed for charity, NGO, churches and other fund-raising websites.Impressive features available with this WordPress theme include: Built-in PayPal Donation System, Cause Post Type, WooCommerce support, limitless page builder, an advanced admin panel, causes searching system, unlimited sidebar and many more. So that was a collection of 11 finest WordPress themes that can render an incredible appearance and functionality to your charity website. Hope you’d have definitely chosen your pick and would install the same in your site. Please spare a minute to drop in your feedback/suggestions on the above post. If you’ve a charity WordPress theme to share with our readers, please proceed ahead using the comments box below. Edword Jones is a web developer by profession and a writer by hobby and works for WordPrax – WordPress CMS development company. He loves sharing information regarding WordPress development tips & tricks. 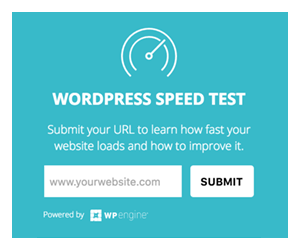 If you are looking for wordpress developer then just get in touch with him.